Are you ready for some football sugar high? Yes? Awesome. Well be prepared to be overloaded by an ice cream so sweet, so dangerous, you may have to go get a smaller bowl. This is Blue Bunny's Chocolate Seduction. Seduction is definitely the key word here, but good luck trying to explain it to your elementary school daughter... maybe, they should have called it chocolate tempation, that's easier to explain.... hehehehehehe, but seriously, when she asked what this flavor was, I just said "(French silk) chocolate ice cream with marshmallow (bon bon), dark chocolate flakes and a fudge ribbon". Sounds pretty fancy schmancy, so let's take a closer look. I crack open the container and for a second I think someone has slipped me some mocha ice cream. I do a quick sniff test but no coffee here! I check the container again. It just looks darker in print then it does in real life. So weird. I don't think I've seen a chocolate like that since the excellent Turkey Hill Getrude Hawk review. Let's dig in and get this party started! In two words? MILKY WAY!! I mean 3 Musketeers! 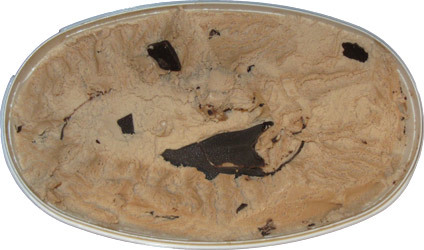 You try resisting an ice cream that looks like that when you scoop it out. This one is plain evil and I dream about it all day long, it's just that potent. This is one of those flavors that beats you over the head with it's sweetness, yet you get right back up and have another spoonful, and another, and another. The french silk chocolate and marshmallow bon bon come together in a way that can only be described as a cold yet creamy ode to the Milky Way 3 Musketeers candy bar. It's uncanny really. There was some debate on how strong the marshmallow flavor of clusterfluff was, but there is no debate here. The funny thing is that it's even kind of got this marshmallow gumminess to it. I usually mean that in a bad way, but here is really works towards enforcing the notion that this isn't your typical ice cream. The chocolate mixins that you see calling your name above are really the perfect finishing touches. 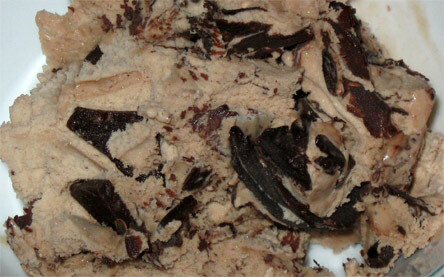 The dark chocolate flakes are simply huge while the fudge swirl is thick and, well, fudgy. It's the kind of fudge flavor you might find on a true boston cream pie. It's solid yet not really crunchy, the flakes are there for crunch. Instead the swirl is frequent and adds a bit of gritty texture to the whole thing. Oh, it seems like every bite has an awesome ratio of ice cream to chocolate swirls and flakes. So, I'll say it, I love this one and it's crazy chocolaty and sugary combo. I've had hundreds of flavors yet this one still has me going "is it time for ice cream yet?" The way it stands out from other flavors is fantastic in my mind. I've had 4 bowls now and it gets better everytime. I couldn't even wait to dig in Monday night. I devoured a bowl and then helped put the kids to bed (it's always the other way around). Sure, this one isn't for the faint of heart or the easily queezy, but man is it addicting. How does the sugar level in this relate to Turkey Hill's Whoopie Pie ice cream? That is my gold standard for sugar overload. ahhh, good call. I'd say this is just a bit more since it's a straight marshmallow flavor --- makes me wish I had some left over for a side by side comparison. Sweeter?! Wow, just the thought of eating this ice cream already has my teeth falling out. Speaking of sweet ice creams, I've got a review of one of B&J's sweet ice creams going up tomorrow. You were a big fan and so am I.
I hope my local store gets this; it looks and sounds delicious! 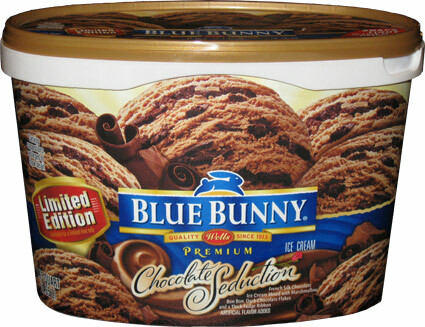 They seriously need to start distributing more blue bunny flavors around where I live. I get so jealous of you at times. the more of their flavors I try, the more I appreciate them. Ooooh this looks wonderful. But I have to wait until we eat the Blue Bell Christmas Cookie flavor that's patiently waiting in our freezer. @Space Monkey: hey, that sounds very cool. If you want to snap a few shots and send a review (of whatever length), let me know! My friends and I came across this flavor in another state once and ohhhhhhhhh I wish I could find ti again. At least, now I have the name of the ice cream that haunts my taste buds. And I don't usually like chocolate ice cream... Awesome review!